The Real Cost of Prisons Project has published three comic books that call attention to the impacts of mass incarceration on individuals and communities. RCPP’s 2005 comic book, Prisoners of the War on Drugs, examines the impact of the War on Drugs. One character in the comic book, Yvonne, is 22 years old and pregnant for the first time. She received a two-year sentence for sale of a controlled substance in a school zone, which triggers an “enhanced sentence” in Massachusetts. An enhanced sentence is a discretionary higher charge brought by a district attorney resulting in a longer sentence. While incarcerated, Yvonne gave birth in shackles and her baby was placed in foster care. This character’s story represents an experience that many women face when they are incarcerated and pregnant. 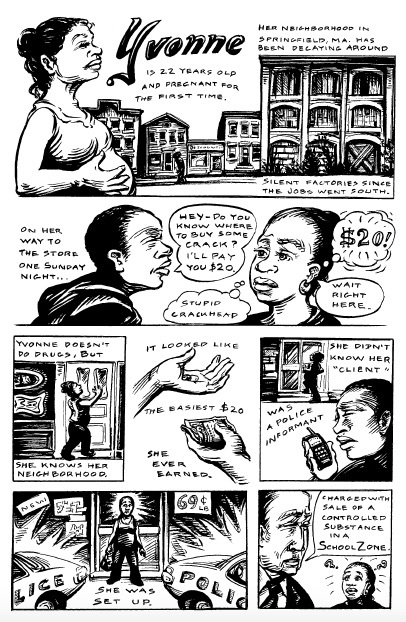 For every mother in prison, the comic book explains, a family and community are punished. For more than fifteen years, The Real Cost of Prisons Project (RCPP) has educated, advocated, and organized against mass criminalization, mass incarceration, and hyper-policing of historically marginalized communities. RCPP’s founding director Lois Ahrens recently redrafted legislation to outlaw videotaping of incarcerated women being strip-searched by any guard. She continues to fight against building new jails in Massachusetts. Ahrens advocates on behalf of incarcerated women and men and supports the intellectual, artistic, and organizing work of people who are incarcerated. In 2013, Ahrens began organizing with Andrea James, founder of Families for Justice As Healing. Families for Justice As Healing focuses on raising public awareness about the incarceration of women and the impact on children and communities through legislative advocacy, policy advising, education, community organizing.